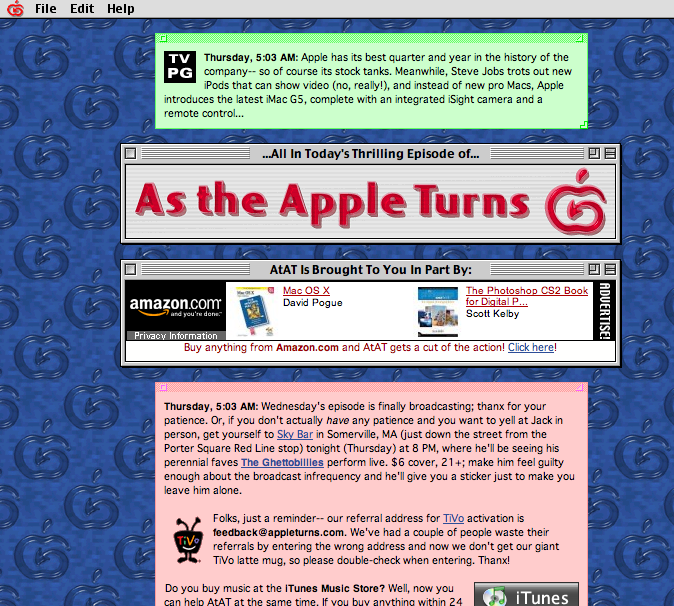 There was a time when there was one site I would spend the time to read every single day, and that site was As The Apple Turns. A pro-Macintosh site with a humorous slant, As The Apple Turns should have been, in my opinion, required reading for every Macintosh owner. But it hasn't been updated since the video iPod came out, and now as I search for it, it appears as though the server is gone. This is a great loss to the Macintosh and humor community. If you are out there, get in contact with us! We miss you! I enjoyed As The Apple Turns myself ... but I have to admit ... I saw it as competition to this site. While the webmaster and author of the articles, Jack Miller, is a much more talented writer than I am, I try to keep up with most of the Apple world's drama. I often submitted ideas and often found ideas in the commentary at ATAT. I hope everything is ok with Jack. Someone should update us. [UPDATE] I tried going to the whois registry to see if I could find Jack Miller's contact information. No luck ... the information is locked. This website has a good background on As The Apple Turns and it's author/staff. I think Jack Miller's gig is writing for Tera Patrick's Mac360 now, check out http://www.mac360.com and search for "jack miller". There's a couple articles there written by him. Thanks for linking to the EXACT SAME source I did in my article ... nobody beat me to it! "Jack Miller's gig is writing for Tera Patrick's Mac360"
Why doesn't he just come out and say that on Apple Turns? I don't think Jack D. Miller (Mac360 forums), Sys. Admin from St. Louis, MO, is the same guy. Jack Miller, from aTAT lives in Boston. Guess he coulda moved, but the other Jack's been posting on Mac360 since 2004. And doesn't have aTAT Jack's (writing) voice - quite an original that one. I hope all is alright with him and his family - he, Katie, and Anya sure brightened up the Mac 'verse. Thanks for the clarification ... I researched it too ... it's not the same person. Although you would have thought with two websites that saw traffic between them of 500,000 ... there would be an answer. I noticed some remarks about headaches (he called himself "migraine boy" at some stage in one of the later posts after a longer hiatus). I wonder if there were serious health problems forcing him to stop. Very bad scenarios with head tumors and sudden admissions to hospital come to mind. I wonder now that the server is off line (actually, the machine is online but the web server on it has died) what is going on. I hope he is well. problems or not ... I find it very inconsiderate of him or his family not to update the mac web ... knowing that he was somewhat of a celebrity. Jack's my brother in law. He's fine. He and my sister have a pre-school daughter who takes up a lot of their time.